This drawing shows the footprint of the proposed new county courthouse. 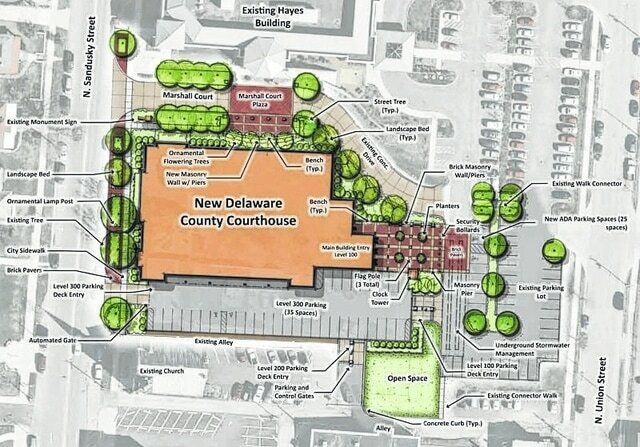 Delaware County commissioners are asking for a second informal review of the planned county courthouse building expansion before the city’s Historic Preservation Commission on Thursday. At a recent joint meeting between county commissioners and City Council, county facilities director Jon Melvin said the county first met with the Historic Preservation Commission in April. Melvin said they also showed the plans to the Northwest Neighborhood Association, which gave “pretty positive comments” to the design. This Historic Preservation Commission recommends architectural standards for the downtown historic district to City Council and reviews all exterior changes to structures and properties located within the district, according to the city’s website. The $21.6 million courthouse would have 80,000 square foot of office space and 165 parking spaces. It would likely house the Delaware County Common Pleas Court, the Delaware County Clerk of Courts Office, the Delaware County Prosecutor’s Office, Adult Court Services and Adult Probation Authority. The three-level building would have two levels of parking and offer separation of prisoners and the public. The building could be expanded to 110,000 square feet if needed. In order to build the courthouse, the former Elks Lodge on 110 N. Sandusky St. will be demolished this fall. The lodge had been at the center of a dispute between the city and the county last year. Some in the city wanted to preserve the building, citing its historic past. In addition, the building was in the city’s historic district. However, the county, which owns the building, said they couldn’t have offices in what was once a house, and the building wasn’t worth salvaging. County officials had also discussed building the courthouse outside of the city if they couldn’t demolish the building. The city relented. The county will still need approval by the city’s boards before construction can proceed. County officials said the courthouse is expected to be completed by March 2017. The Historic Preservation Commission meeting will take place at 7 p.m. on the second floor of City Hall, 1 S. Sandusky St. The meeting is open to the public.